For anyone who does not live in a large city, it is common knowledge that each home has its own well dug into the ground. Sometimes these wells only need a few feet to reach a source of water, other times, the well has to be dug even deeper. For wells that only reach the maximum allowance of twenty-five feet, a jet pump is usually installed. However, for a well that must be dug even deeper, a submersible pump is required to get water from the well into the household. The difference between these two pumps is how they function. A submersible pump pushes water up through the well and into the house while a jet pump uses suction to pull water. It is indisputable that submersible pumps are more reliable to get water into your home, so if you have a deep dug well, always install a submersible pump. But how does one actually install a submersible pump? It does seem rather complicated. However, if keep your manufacturer's instructions at hand and follow this guide, you can have a new submersible pump installed in an afternoon. To start you should always make sure you have done your research and compiled a list of supplies that you will need. This includes everything from the submersible pump itself to the correct piping, extra wire, an extraction tool, wrenches, and heat-shrinking tubing that is self-sealing. Once you are sure you have everything, lay it down around your well and be prepared to work. This is a two man job so find a friend and get them to help you. With wrenches, twist the piping onto the pump, making sure it is tight. Get your friend to hold the piping and the pump together. It cannot be stressed enough just how important it is to properly protect the wiring of the submersible pump. Nothing will short out the pump faster than improper wire-care. Over the test of time, it is far more likely for a pump to short out due to wires becoming exposed rather than for the motor to die. Firstly the wires that come with the pump must be attached to the extra wires so they may travel up the well-shaft. They then must be covered with self-sealing and heat-shrinking tubing. Then the tubing must be sealed over top using a torch. Then the wires must be carefully arranged so they are not exposed to friction due to the motor. Using electrical tape to hold them in place will do this. A torque arrestor is essentially for a submersible pump. The device spreads out, almost ballooning, and protects the pump from bumping off of the sides of the well. This is important as it holds the pump still and in the place where it needs to be. To attach it, simply place the torque arrestor on the piping just above the pump. Use plumbers tape to very loosely keep it in place, tightening it just enough so it will not fall off but it can still slide. Then begin to have your friend lower the pump into the well just enough so you can adjust the size of the torque arrestor just right so it fits the circumference of your well. Afterwards, pull the submersible pipe back out of the well and completely tighten it into place. With your friends help, slowly lower the pump into the well. As you go, tape the wires in place to the piping every ten feet. This will keep the wires firmly in place and make sure no damage is done to them. As you lower the pump, attach extra piping as necessary to the submersible pump. Have your friend hold the piping in place as you attach more. Firmly twist it and then secure it with a piping wrench. Once the piping has come to an end, attach the cap of the well and run the wire through the proper hole and the piping through the other. Now that the pump is submerged and in place, assemble the house piping to the well. This will allow you to draw water to your home whenever you need it. A submersible pump works by pushing water into the house from the well whenever you call for it, which makes it a more eco-friendly pump that conserves water. Run the wires to a proper power source, making sure to properly install them to keep them away from water or other potential threats. And just like that, your pump is installed and ready to use. Test your pump pre-installation to make sure it works. Make sure your well is over 25 feet deep, else wise you need a jet pump. Consider even asking a third friend to help to offset some of the heavy-lifting. Submersible pumps may seem intimidating and like something you must call a plumber for. 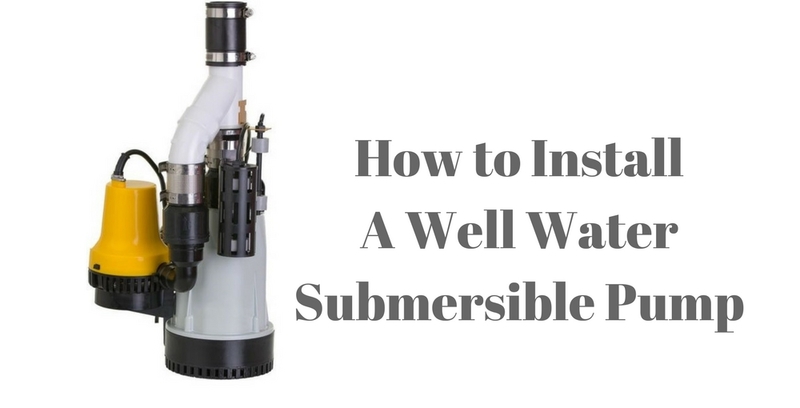 However, with a few helping hands, the right tools, and the right materials, you can quickly assemble and install a submersible pump to use in your well in an afternoon.